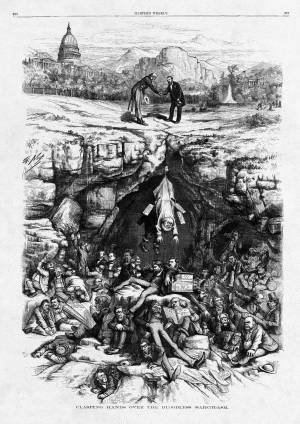 In one of his most spectacular designs, Thomas Nast ventures an elaborate, grotesque overview of the 1872 presidential election. In it, President Ulysses S. Grant, triumphantly returned to office for a second term, politely "clasps hands" with Uncle Sam, as the chasm closes to doom Greeley's misbegotten coalition to an eternity of torment and disfavor. Note Uncle Sam's deep bow of respect and perhaps relief, as opposed to the Grant's more restrained gesture. Tranquillity has returned to the scene (above ground), with the republic safe for at least four more years.